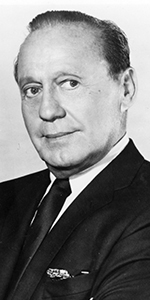 Jack Benny became the best-liked radio comedian of the 1930s and 1940s. His trademark deadpanning served him well in everything he attempted: vaudeville, radio, motion pictures and television. Born to Polish and Lithuanian immigrant prarents, young Benjamin began playing the violin at the age of six — but hated practicing. Totally indifferent to schooling, he dropped out of business school in order to play violin on the vaudeville circuit. Benjamin Kubelsky teamed up with musician Cora Salisbury, but when concert violinist Jan Kubelik found out about Kubelsky's playing, he forced Benny to change his last name, who chose Benny, and there you have it — Ben K. Benny. He toured with pianist Lyman Woods and played The Palace in New York City, but it did not go well. Benny quit showbiz and joined the U.S. Navy in 1917. While playing violin for a group of sailors, they began to heckle him. Fellow Navyman Pat O'Brien suggested Benny make a joke about his poor playing to get out of the situation. It worked so well that Benny used the device for the rest of his career. He began touring as "Ben K. Benny: Fiddle Funology" but was then pestered by fiddle-playing comedian Ben Bernie over the name similarities, so Ben adopted "Jack" and now, we have — Jack Benny. In 1927, Benny married Sadie Marks, who, as Mary Livingstone, became the straightman in Benny's act. By 1929, Benny was playing on the bill at the Los Angeles Orpheum Theatre; Benny's agent Sam Lyons got Metro-Goldwyn-Mayer exec Irving Thalberg down to see his act. Benny was signed up to play one of the hosts in The Hollywood Revue of 1929 (which world premiered at the Chinese in June, 1929). Benny's subsequent films didn't pan out, and by mid 1930, he was starring on Broadway in Earl Carroll's Vanities. Ed Sullivan asked Benny to guest star on his radio show in 1932, after which, Canada Dry's ad agency offered him his own show. The Jack Benny Program ran from 1932 to 1948 on NBC, and from 1949 to 1955 on CBS, becoming the highest rated show during this timeframe. CBS continued to re-broadcast episodes until 1958 as The Best of Benny. Benny became a producer in the late 1940s, producing the film The Lucky Stiff with Dorothy Lamour (released in May, 1949), and the original stage version of Mister Roberts with Henry Fonda, as well as being involved with several other radio programs. After doing a local tryout on KTLA TV in Los Angeles, The Jack Benny Program took to national television from October, 1950 to 1965 on CBS, with episodes initially coming only every six weeks, but by 1960, was on the air every week. Interspersed with all of this, Benny made quite a number of films, including Broadway Melody of 1936 (which played the Chinese in September, 1935), Artists and Models (released in August, 1937), Charlie's Aunt (which had its world premiere at the Chinese in July, 1941), To Be or Not to Be (which played the Chinese in February, 1942), George Washington Slept Here (released in November, 1942), and The Horn Blows at Midnight (released in April, 1945). But as his television show took over his schedule, Benny did many walk-ons in films such as Without Reservations (released in May, 1946), and Who Was That Lady (which played the Chinese in March, 1960). Benny did a cameo in It's a Mad, Mad, Mad, Mad, World (released in December, 1963), then toured as a stand up comedian, while occasionally appearing on The Tonight Show with Johnny Carson, and other television programs. In late 1974, Benny complained of numbness in his arms; tests were inconclusive. Later tests indicated pancreatic cancer. He fell into a coma and died at home on December 26, 1974 at the age of 80. Grauman's Chinese Theatre, Hollywood, California. 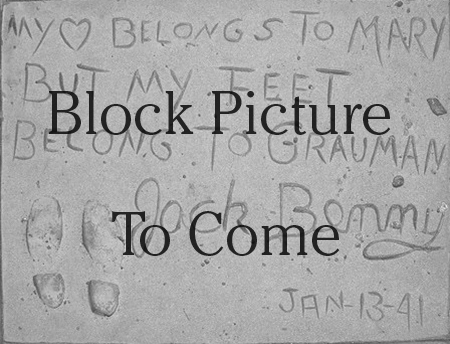 Jack Benny Forecourt ceremony, Monday, January 13, 1941. 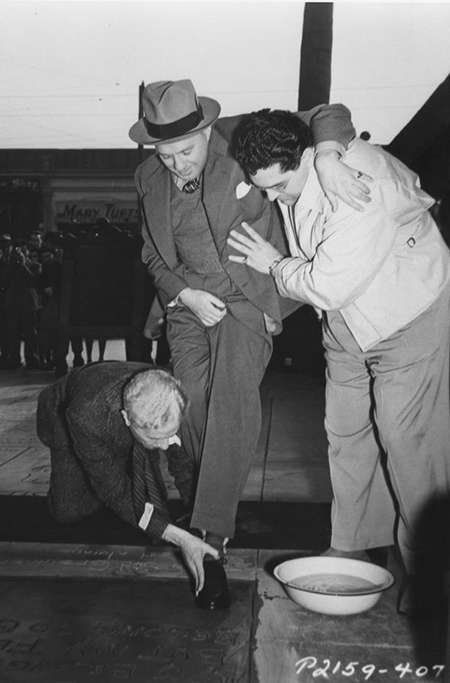 Sid Grauman places Jack Benny's foot in the cement while an unidentified man lends support.